New recordings are stored as files with the name you choose in Settings under New macro name. By default, this is #Current and the extension is .iim. You may however, change this default to any name you prefer. 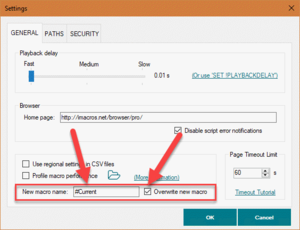 Besides that, you have the option to create a new file every time you record a macro, by un-checking Overwrite new macro. In this case, iMacros will create a new file and add a number to each new version, like #Current(1).iim, #Current(2).iim, etc. This page was last modified on 14 August 2017, at 16:37.